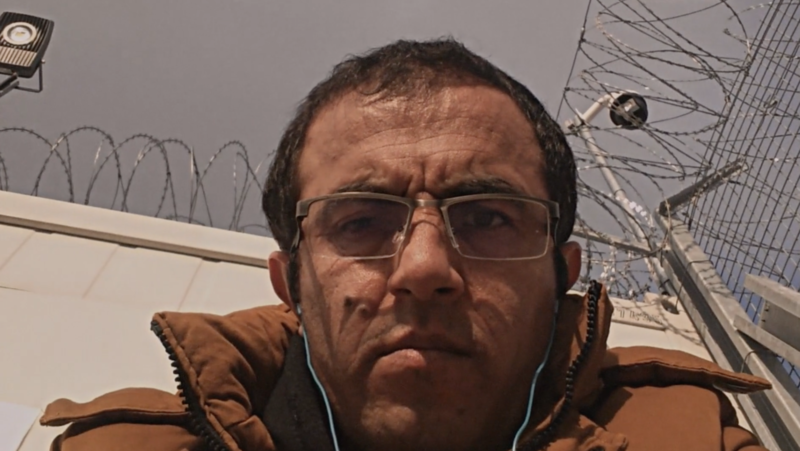 A screenshot from the documentary "Midnight Traveler" shows refugee Hassan Fazili in a detention center in Hungary. After being threatened by the Taliban, filmmaker Hassan Fazili was forced to flee Afghanistan. Like thousands of others, he and his family set out for Europe seeking safety and a stable life. What follows is a two-year odyssey that Fazili, wife Fatima Hussaini, and their two daughters carefully documented on video with their phones. From negotiating with people smugglers to hiding in abandoned buildings and being beaten by Bulgarian nationalists, the new documentary "Midnight Traveler" highlights the cruelty and capriciousness of the European Union's asylum system – and a family's strength to persevere. On this special edition of Global Journalist, a look at this remarkable new film and an extended interview with producer and writer Emelie Mahdavian. After debuting at the Sundance Film Festival earlier this year, the film recently screened at the 2019 True/False Film Festival. Global Journalist: Australia's Refugee "Islands of Despair"
Australia's continued detention of about 1,000 refugees and asylum-seekers on two remote Pacific islands has garnered international criticism as details emerge of alarming rates of attempted suicide and poor medical care. Yet many Australians see the island detention centers as a necessary deterrent to keep the country from being overrun by a tide of migrant boats from Indonesia. On this edition of Global Journalist, a look at the conditions for the hundreds of migrants who have spent years in Australian detention on Nauru and Manus and the debate about their fate in Australia. Global Journalist: 'Reverse' missionaries seek converts in Europe, U.S. There are now nearly twice as many Christians in the Global South as there are in Europe and North America. As Christianity's center of gravity has shifted - so too is the flow of missionaries. Thousands of Christians from places like Brazil, Nigeria and South Korea - where Christianity was first brought by European and North American missionaries - are now traveling to Europe and North America seeking to convert the natives. On this edition of Global Journalist, a discussion about the growing phenomenon of "reverse missionaries." Women's rights and opportunities have improved in Afghanistan over the past 15 years after the ouster of the Taliban. They're no longer required to wear the burqa and are again allowed to attend school and leave the house without a male relative. But as several recent incidents have highlighted, women in the country still face high levels of violence – including honor killings, forced marriages and and imprisonment for fleeing their husbands. On this edition of Global Journalist, our panel examines the challenges and opportunities for women in Afghanistan. In addition, a bestselling author discusses the longstanding practice of families without sons dressing and raising their daughters as boys, a phenomenon known as "bacha posh." About 5,000 women are killed each year in so-called "honor" killings around the world. These are crimes in which the victims, who are almost always female, are killed by family members - usually men - for bringing what they see as dishonor on the family. Pakistan and India have the highest rates of "honor" killings in the world. But a new law in Pakistan has made such killings illegal - and raised hopes that the government will address gender violence more effectively. On this edition of Global Journalist, a look at the history of these killings and some recent high-profile cases that have renewed efforts to end the practice.